Well, a very nice reader left a comment on my blog, he gave me a website that has a water filter/purifier that can be made at home it’ s easy, no difficult instructions, no impossible parts to purchase, it is a very simple system using only 4 parts, yes, 4 parts! I’ll post the instructions here, and I’ll give the link to the site where you can get the PDF download, I highly recommend it! I love my Berkey water purifier, and if I had it to do over again today, I would still buy it, but I do plan on using one (or more!) of these homemade water filters too. Handle the ceramic pot carefully to avoid breakage or cracking. Small invisible cracks may allow microorganisms to pass through the filter, making the water unsafe to drink. If a ceramic pot full of water takes less than 3 hours to empty, the flow rate is too fast and the ceramic pot should be replaced. Fill the ceramic pot three times, allow the water to seep through, and discard the filtered water. Doing one of the above two steps will flush the clay smell and color from the ceramic pot. You only need to do one of the above steps, it is not necessary to do both. Lastly, clean the receptacle tank and spigot with soapy water. DO NOT use soap to clean the ceramic vessel. Put the filter in a safe place where it will not get knocked over and secure it to the wall or a post. If the water source is very dirty, tie a piece of cloth over the top of the filter to strain out the dirt and debris. The filter will flow faster when the ceramic pot is full, so fill it often. Keep the lid closed to prevent dust and mosquitoes from entering. The ceramic pot should be cleaned once per month or when the flow rate begins to slow down. – Clean the inside surface of the lid with soapy water and let it dry. Place the lid on a level surface with the clean side facing up. 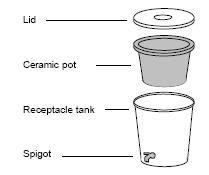 – Carefully lift the ceramic pot out of the receptacle and set it on the lid. Touch only the rim when lifting the ceramic pot. Do not touch the outside of the ceramic pot with dirty hands and do not set it on an unclean surface. – Scrub the inside of the ceramic pot with a cloth or soft brush and rinse with clear water. Do not use soap to clean the ceramic pot. – Clean the receptacle tank and spigot with soapy water. Put the ceramic pot back into the receptacle tank immediately after cleaning to prevent recontamination. The pot does not have to be dried after cleaning. It is important to practice good hygiene to ensure that the water that leaves the filter clean stays clean. – Do not touch the outside of the ceramic pot, the inside of the receptacle, or the spigot opening with dirty hands. – Place the filter up off the ground in a clean and tidy place. – Wash hands and drinking glasses often with soap and water. · The filter has been used for three years. The post for the download of the PDF does not work. Does anyone have another link? What does this kind of filer actually remove from the water. I have been using Brita activated charcoal filters but I hear that it only filters taste and chlorine. Thoroughly I really like your post because today water pollution problems are increasing day by day and we need better solution to get rid this problem. I think your post is a good solution for this problem. Wow man! !I really like your post, thanks for sharing with us. I am thinking that it will work nicely above ground. Obviously a pot made with more sawdust (or other fibers) and no hole is better, but if you are like me and still trying to make a flower pot work, you might try these ideas: Menard’s has a “test plug” made for plugging the end of a PVC pipe for pressure testing. It is plastic, apparently safe for water, and a great soft sealing gasket. Regarding the “glaze” on the pots, try a wire brush tool on an electric drill. You can buy the real thing from Potters for Peace, on their website. GREAT article…however, what size pot; where to buy; how to plug holes?? 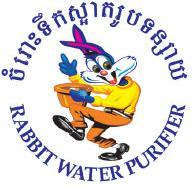 Where can you find a pot without a hole in it to use for the rabbit water purifier system? Perry, that seems to be a difficult part to find, especially if you are looking in the ordinary places that carry gardening items. I have decided to try asking a couple of potter friends of mine to make the pots for me, that way I know exactly what the pots are made of and I can get what I want. Look around, ask around to try to find someone who can make the pots for you. Tracy, how thick is the pot? I assume it was a standard size and thickness… Did you soak it first or do the other step to clean and flush it? Maybe soaking it would help the water flow through faster??? I have a friend who does ceramic sculptures and pottery, I’ll try to ask her about possibly making a pot for me to try, they need a water filter too, maybe we could work on something together…. Hi Wretha; I bought a big unglazed clay pot from Walmart and plugged the hole with a rubber stopper from a health food/homebrew supply store, then set the pot in a 5 gallon food grade bucket and poured water in. It takes a week to seep through. I think that’s just too slow. The people building such filters for African tribes add chopped straw to the clay mix to make it more porous. Thanks for that info Wretha, I have been searching for some time now for something simple yet effective. That sounds good, whatever you use, it would need to be sealed, you would not want the water to be able to leak around it even the tiniest bit, pure silicone would work to seal it. A good old fashioned Cork plug maybe? The pot has a hole in the bottom but I think I can plug it up with something. Still thinking on that. Hope to get to town in a day or 2 to find a bucket that it will fit in. Gas is just to high to make trips without having several things to do at the same time. I’ll let you know what I find. Scavenger, does this pot have a hole in it or is it solid in the bottom? Wretha, the pot from Lowes is unglazed, got one today. Was unable to find a bucket the right size so, I guess I’m on hold again. Hope this link works for you. I am pretty sure it is unglazed, will know for sure tommorrow when I go to lowes, wasn’t able to get there today. Too many weeds in the garden. I’ll let you know for sure. Hey Chris, let me know how it goes! I have been looking on line for unglazed ceramic pots, I haven’t been able to find anything suitable, if you can find something, would you let me know what it is, where you found it and the price, thanks! Thanks so much for this post, I love simple things that REALLY work. I will be gathering the supplies tommorrow to make this handy water filter. Once again, thanks.